Senior Health: What Causes MS? Multiple sclerosis is one of those diseases most people don’t associate with the senior population since most people are diagnosed before 50. In reality, there’s still a small percentage of people who are diagnosed with MS in their golden years. It’s not uncommon for concerned or curious family members to ask Rhode Island senior care providers about the causes, symptoms, or treatments for various diseases. So today, we’ve decided to use this blog to explore the causes, or lack there of, of multiple sclerosis. Although researchers have narrowed down how multiple sclerosis works, why the disease occurs is still the subject of intensive studies. Researchers are focused in three general areas to discover this answer: immunology, the science of the body’s immune system; epidemiology, the study of patterns of disease in a population; and genetics. Researchers are also studying specific infectious agents to determine if they may have a role in the onset of MS.
Scientists have disproved many theories of MS causation. As summarized by the National Multiple Sclerosis Society, research has disproved conclusively the myths that MS is caused by living with a dog or other small pet, having allergies, exposure to heavy metals, consuming the artificial sweetener Aspartame, or experiencing physical trauma. 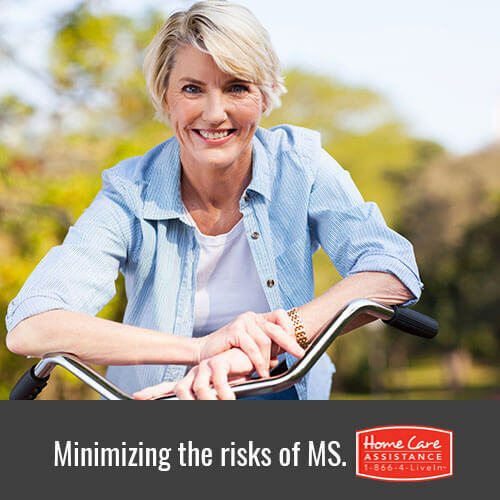 Additionally, there is no clear evidence of clusters (the perception that a very high numbers of cases of MS in a specific location or time period) existing for a particular reason, though researchers continue to assess this possibility. There is some evidence that there may be a role of a virus in MS. A specific virus (or viruses) has not been identified and researchers need to determine if a virus does not just exist alongside the disease but actually causes it. Some viruses receiving intensive study are the Epstein-Barr virus (EBV; mononucleosis), human herpes virus 6 (HHV-6), measles, canine distemper, and Chlamydia pneumonia. The research on these viruses is multifaceted, looking at a number of interrelated factors. For example, current or previous smokers with the highest levels of EBV antibodies were 70 percent more likely to develop MS than those with neither risk factor. Epidemiologists are studying how variations in geography, demographics (age, gender, ethnicity, etc. ), genetics, infectious diseases, and migration patterns may relate to MS. One clear pattern that has been observed is that the farther away one lives from the equator, the higher the risk of MS. This has lead researchers to focus on the possible role of vitamin D deficiency, as those with more exposure to the sun in equatorial regions have higher vitamin D levels. Smoking also has a strong link to the disease and researchers have established that quitting smoking can slow its progression. Geneticists have established that MS is not hereditary, however, they are looking into the relationship between genetic make-up and the onset of the disease and its progression. For example, they are researching if one’s genetic make-up predisposes a person to acquiring the disease if exposed to a specific virus or environmental factor. One of the best ways to prevent any disease is through a healthy lifestyle. At Home Care Assistance of Rhode Island, all of our care plans include the use of our Balanced Care Method, designed to promote wellbeing through diet, exercise, social stimulation, and a sense of purpose. To learn more about BCM or to find out how live-in or hourly care in Rhode Island can help your loved one maintain a high quality life, please call (401) 284-0979 and speak with a friendly Care Manger today.